Last year, I spent Easter in northern New Jersey with my boyfriend’s family, half of whom are of Greek descent. Needless to say, I was in heaven. I have a soft spot for Greece. I lived in Crete until I was five, and I have returned to Greece twice in the past 5 years for vacation. If I had a free plane ticket to travel anywhere in the world, I would go to Santorini. 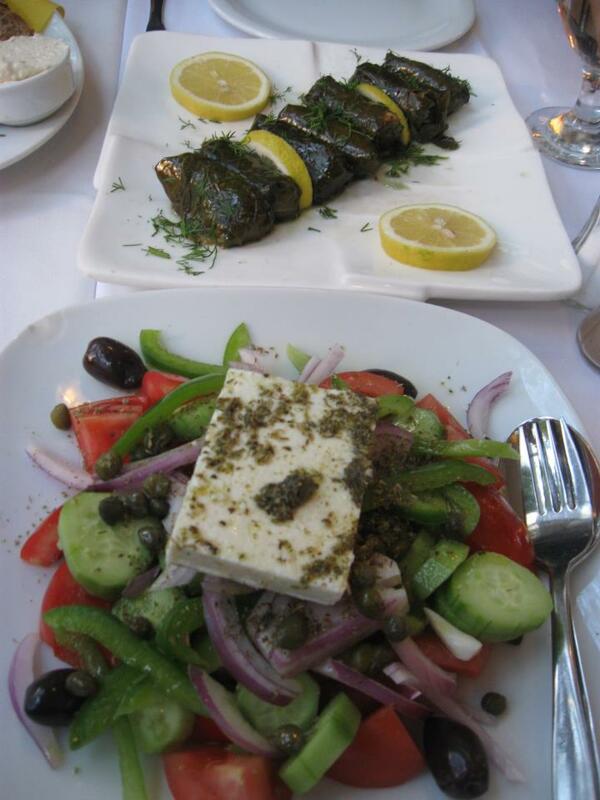 If I could only eat one meal for the rest of my life, it would be horitatiki (traditional village salad), dolmadakia (rice stuffed grape leaves), and tzatziki (Greek yogurt with cucumbers, garlic, and dill). No contest. Because of my various food sensitivities and preferences (gluten-free, minimal dairy, no cow/pig/lamb), my options were slightly limited for the large Easter dinner. No matter. To me, cooking–especially for large family functions–is far more enjoyable than eating. I enjoy the time spent in the kitchen far more than the time spent at the dinner table. 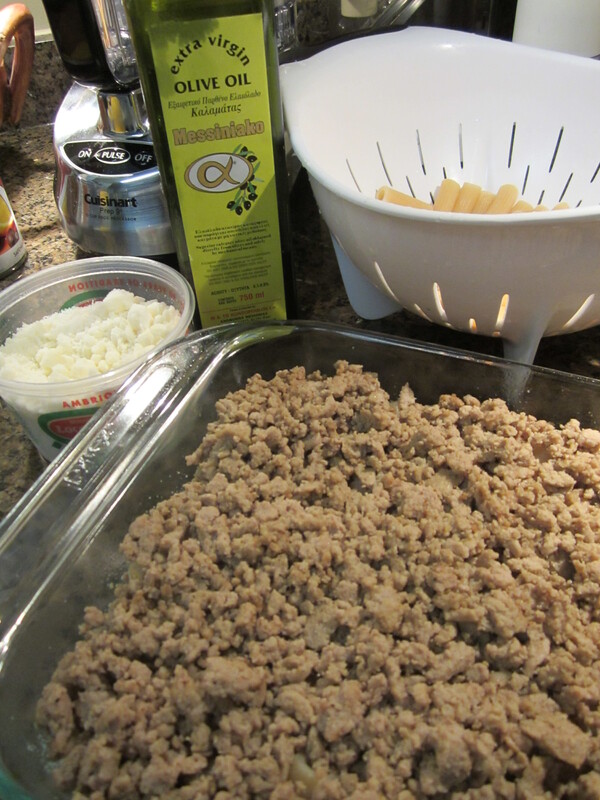 I jumped at the chance to spend a full day with C’s Greek grandmother cooking our hearts out, and being the saint that she is, the last item we prepared was a gluten-free, “skinny” version of Greek Pastitsio with lean ground turkey, gluten-free pasta, and a revised Bechamel sauce exclusively for me. Pastitsio is in essence a Greek lasagne with either ground beef or lamb. Grandma K and I seasoned lean ground turkey with nutmeg, garlic powder, and onion powder, and then layered the meat along with a very thin layer of Pecorino-Romano cheese. I love this cheese because of its potency, a little goes a long way in terms of flavor. The “Bechamel” we poured over the Pastitsio was comprised of whisked eggs and soy milk. Easy peasy, not to mention lighter than the original, and equally delicious! 1. Pre-heat oven to 350 degrees F. Coat a 9×9 glass dish with cooking spray. 2. Cook pasta according to instructions. 3. While pasta is cooking, heat olive oil over medium high heat, then add turkey. Cook until meat is completely done, breaking with a spoon as you cook. 4. Add nutmeg, garlic powder, and onion powder to the meat. (If you want to add more than what I’ve listed, go ahead!). Season with salt and pepper to taste. 5. In a bowl, whisk eggs and milk. 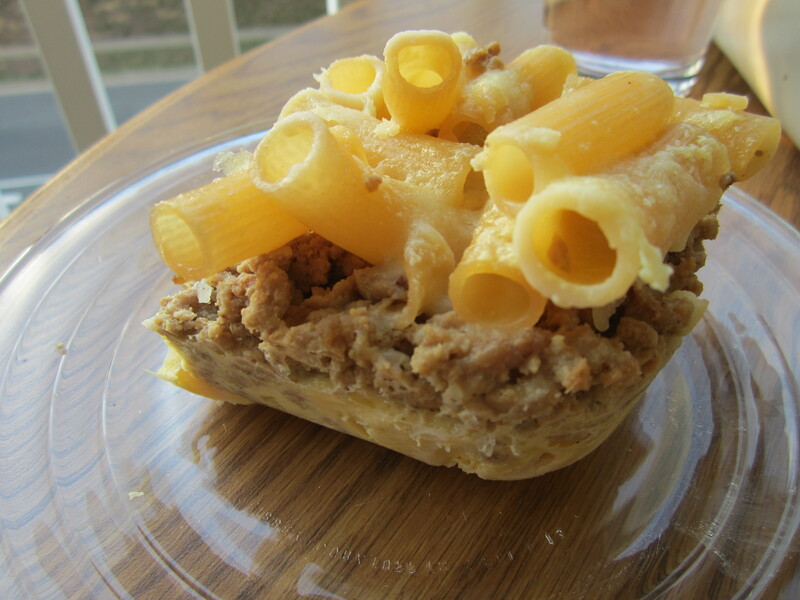 Set aside while you layer the Pastitsio. 6. Drain the pasta and pour half the amount into the bottom of the glass dish. Sprinkle 3 tablespoons of cheese and one tablespoon of butter (diced into small pieces) over the pasta. 7. Add the entire pan of cooked turkey to the top of the pasta. 8. Add the remaining pasta and layer with remaining cheese and butter. 9. Slowly pour egg and milk mixture over the pasta, allowing the mixture to seep into the layers. 10. Cover dish with foil and bake for 30 minutes. Remove the foil, and bake for an additional 15 minutes. 11. Let Pastitsio sit for at least 10 minutes before serving. **Do not worry if the first few slices look like a hot mess on your plate. After sitting in the fridge overnight, it is much easier to slice, serve, and re-heat the next day. This entry was posted in Greek, Pasta, Poultry and tagged Eggs, Good Cheese, Greek, Lasagne, Nutmeg, Pasta and Noodles, Poultry. Bookmark the permalink.